Our Video and Internet applications we provide are all considered industry standard. If you have a product or service that is not on this list, please feel free to contact us so that we can incorporate your technology. 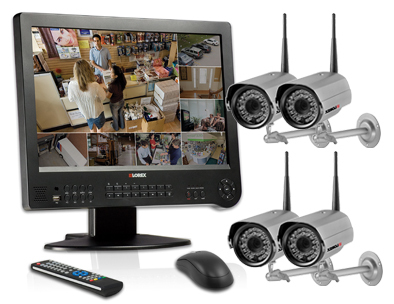 We have a dedicated Video Monitoring center for our clients who use DVR services. With four 42” LED screens available for our video monitoring stations, you can be sure that your cameras are seen, and images are large and crisp for the highest resolution. Our DVR and video monitoring is on its own dedicated Fiber fed network separate from our business network. This ensures that we are dedicating the maximum bandwidth available for your video monitored clientele. We also provide integrated video monitoring through the Bold Manitou platform. Manitou’s Video Control Center brings “One point of Control” to Video monitoring to a new level. By providing a single interface to an operator, video hardware from a variety of manufacturers can be consolidated into one simple-to-use interface. Manitou supports video of two basic types: Event driven video and streaming video. Event driven video is sent into the system as the result of an event that has triggered a signal. Manitou processes the event and generates an alarm. The Video clip that generated the alarm is then played to the operator. Streaming Video is live or recorded video that is streamed from the site, video is shown to the operator in the video window. The view-time can be predetermined or operator controlled, this mechanism is ideal for video tours and general surveillance. Connect 24 GSM. We are a Master Reseller of this product. Ask us how we can save you money!